You could say “Romeo and Juliet” is about a pair of crazy, fired-up kids in love. And you could say the new, free mini-production of the play at Seattle’s Waterfront Park is the work of a pair of crazy, mixed-up kids in love with theater. This feisty first effort by the Arts on the Waterfront group is bare-bones. 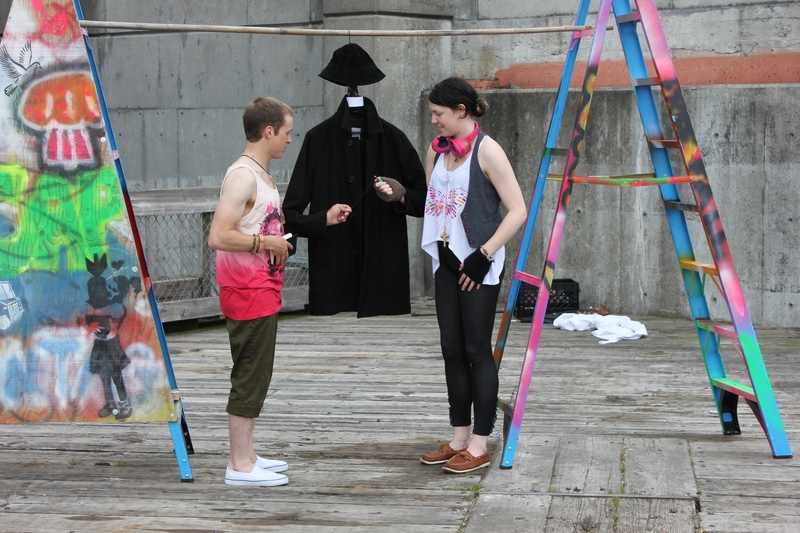 Actor-producers Mickey Rowe and Laurie Roberts perform Shakespeare’s tragedy in a corner of the boardwalk with an expansive Elliott Bay view. At each performance they set up a couple dozen chairs and an ad hoc art exhibit, and after the show they invite you to stay and dance to a live rock band. With a little budget and a lot of moxie, they brave traffic noise, the whoosh of a nearby fountain and a constant flow of passers-by to put across their version of the classic. And, yes, you can transmit the essence of a romantic tragedy with modest means but a lot of creative exuberance and some humble props. A pair of tall ladders serve as a balcony and more. Sword duels are fought with water balloons. A frowzy wig defines Juliet’s nurse. And the music of cellist Brandon Smith sets the scene nicely. The two-member cast, quick-change style, plays all the major characters, switching genders and roles as they tear around the staging area and barely pause for breath. Forget subtlety: The actors shout to be heard (Rowe more effectively than Roberts) and resort to elemental pantomime to get across a condensed, hourlong version of the Bard’s text. But there’s a punky esprit here that carries the day, recalling the great Shakespeare director Peter Brook’s notion of a “rough” theater that may be rugged and no-frills but is unmistakably alive.